Department of Homeland Security Brands ThisCantBeHappening! a ‘Threat’ - This Can't Be Happening! ThisCantBeHappening! has just learned that our little news organization was listed, in an alert fired off to all 78 Fusion Centers by Kelly Wilson, Director of the Washington DC Fusion Center’s Regional Threat and Assessment Center, as a potential threat. 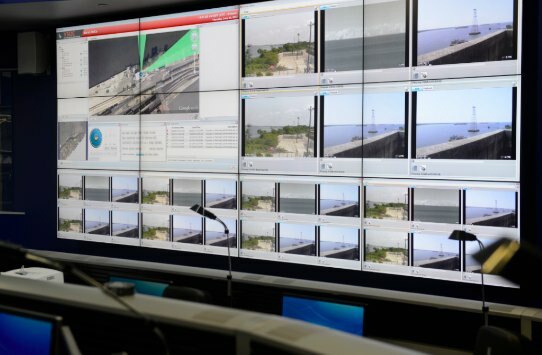 The stated role of the Fusion Centers, which were created (and lavishly funded) in the wake of 9-11, was to link federal, state and local law enforcement agencies in order to better detect and combat terrorists inside the US. So what about this threat posed by ThisCantBeHappening!, though? Well, as Threat Assessment Director Wilson explains in her alert, the threat is that TCBH! 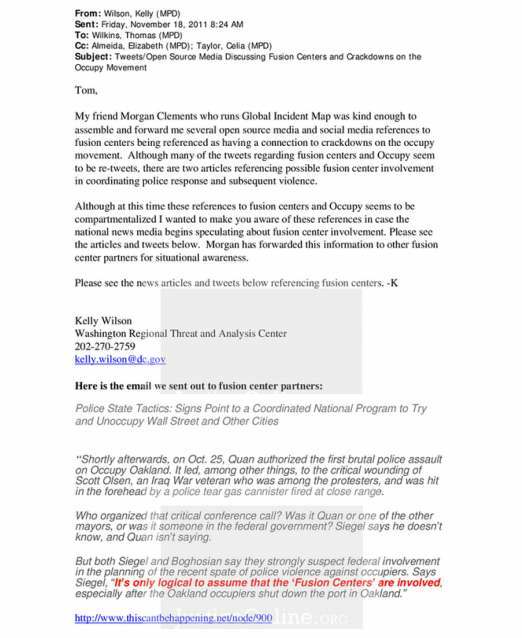 published an article suggesting that the Fusion Centers played a central role in orchestrating the attacks on Occupy Movement actions in cities all across the US. “…Shortly afterwards, on Oct. 25, [Oakland Mayor Jean] Quan authorized the first brutal police assault on Occupy Oakland. It led, among other things, to the critical wounding of Scott Olsen, an Iraq War veteran who was among the protesters, and was hit in the forehead by a police tear gas canister fired at close range. “Who organized that critical conference call [among 18 mayors]? Was it Quan or one of the other mayors, or was it someone in the federal government? [Oakland attorney Dan] Siegel says he doesn’t know, and Quan isn’t saying. While this document and the mentality it represents are deeply disturbing, ThisCantBeHappening! is at the same time proud to be recognized by the Washington intelligence nexus as posing that kind of threat to the emerging United States police state, of which the DHS and its Fusion Centers are a critical element. Sadly though, although our article and the November 18 alert citing it sent out by Wilson ran in late 2011, it wasn’t until this month that the New York Times finally wrote about the Fusion Center role, using this and other documents obtained by the Partnership for Civil Justice Fund (PCJ), a Washington-based public interest legal organization focused on federal violations of the First and Fourth Amendments. And even then, the Times buried its story of Fusion Center involvement in the national crackdown on Occupy in its inside pages, rather than playing it where it belonged on the front page. The paper also made light of the Fusion Center effort, focusing on some of its sillier concerns, such as the overwrought government monitoring of an Occupy Movement call for a boycott of the retail industry’s Black Friday sale weekend. For more information about the mass of documents obtained about the Fusion Centers and their central role in the crackdown on Occupy — which turns out to have been the central activity and preoccupation of the Fusion Centers during late 2011 and early 2012 — listen to the June 5 podcast of this interview by Dave Lindorff of PCJ executive director Maya Verheyden-Hilliard from our radio program, “ThisCantBeHappening!”, which airs every Wednesday at 5 pm Eastern on the Progressive Radio Network (PRN.fm). PCJ obtained thousands of pages documenting the DHS’s and the Fusion Centers’ obsession with Occupy through extensive aggressive use of federal, state and local Freedom of Information inquiries. The results can be found at Partnership for Civil Justice. ThisCantBeHappening! is a collective run by a group of seven professional journalists and writers, none of whom receives a salary. In order for us to do this journalistic important work, we depend, with the exception of a tiny bit of ad revenue, upon donations from our readers. Unfortunately, far too many of you are reading ThisCantBeHappening! without providing that critical support. We ask only that each of our tens of thousands of readers send us at least $5 per year. If you all did that, we’d be able to devote serious time to our work here, rather than having to do it out of our back pockets while trying to make a living doing other things. Please donate whatever you can afford (see the Paypal button at the top of the page, or send us cash or a check made out to Dave Lindorff/TCBH! at POB 846, Ambler, PA 19002.